If you want to discuss Realism Overhaul or how to use Realism Overhaul check out this thread here. Many people have contributed to Realism Overhaul, if you contributed and I missed you on this list, PM me and I'll add you. Realism Overhaul is a mod that makes Kerbal Space Program behave more like real life. If you're interested in seeing what it's like to fly rockets in the real world, this is the mod for you! Realism Overhaul does this by modifying other mods and stock parts to perform as their real-life equivalents. You can expect things to be a little harder, and rockets to be a bit bigger, but the scenes far more epic, and the accomplishment that much greater. Engine performance - Engines use real fuels, real sizes and real performance values. Check out the Wiki for guides on how to use engines! Modified ElectricCharge system - 1EC/s = 1kW. Solar Panels don't produce magical amounts of electricity, but they are much lighter. RTGs don't produce magical amounts of electricity, but many systems don't need as much electricity. These mods are required for Realism Overhaul to function correctly. CKAN will automatically install all of these mods for you when you install Realism Overhaul. These mods are recommended, and installed by default in CKAN. They are not required, and you can install all or none of them to your own liking. These mods are supported part packs that make it easier to build rockets. We suggest installing at least a few of these. Use Procedural Parts for fuel tanks, and remove fuel tanks from your part packs. Use Procedural Fairings for fairings, and remove fairings from your part packs. Use B9 Procedural Wings for wings, and remove wings from your part packs. You can use the AutoPruner Script remove these items. Add -force-opengl -popupwindow following the path to your KSP.exe. 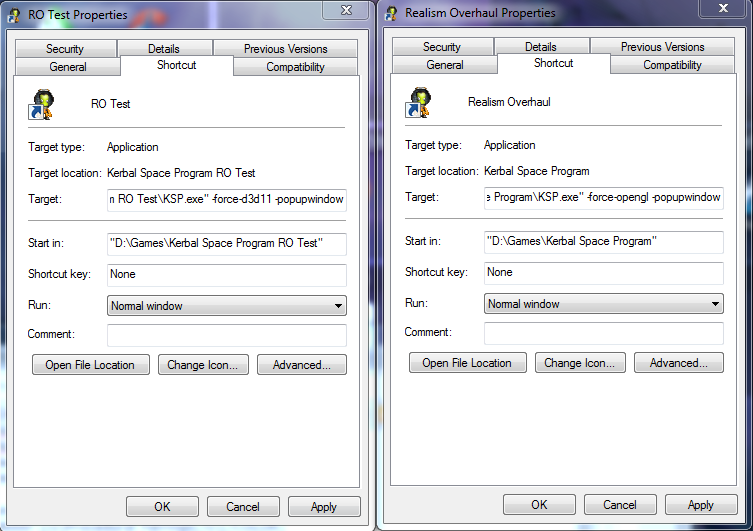 Replace with -force-d3d11 -popupwindow in the path to your KSP.exe. Next, visit the forum thread here and download the latest release here. Note that at the time this guide was compiled, the version with enabled GUI is only available in pre-release format. Place ckan.exe in your KSP installation directory. Currently, we primarily support installation via the CKAN GUI. Other methods may be out of date. Proceed through the menus to select your installation. The GUI has overtaken the command line, and is now more fully featured. But if you're more comfortable with command line interfaces, check out the CKAN user's guide for more information on the CLI. 1. Start with a FRESH unadulterated install of KSP. 2. Download and install the required mods. Ensure you have the most up to date version and have followed their respective installation instructions. Links are provided below as well as some special installation notes/instructions for those mods. 3. Download and install Realism Overhaul itself (download zip archive, unzip all folders inside its GameData folder into your KSP/GameData folder). Modlist removed, redundancy not required. See above for forum links. Realistic Progression Zero incorporates career mode into Realism Overhaul. Note that at this time not all modpacks are supported, see the RP-0 post for more details. Texture Replacer allows you to replace many of the textures in the game (it's in the recommended list for its texture unloading abilities.) For visual effects, we recommend using one of the skyboxes linked in the Texture Replacer OP, especially one of the real life skyboxes. NOTE: at this time, the following are still WIP, so there may be bugs. RealPlume was started by Ferram4 for the Crotchety Old Modders mars mission, further work was put in by Dragon01, Felger, and NathanKell, and has been absorbed into Realism Overhaul. If you're installing via CKAN, it's an optional installation, and requires SmokeScreen. If you're installing manually, it's included in the Realism Overhaul folder, you just need to install SmokeScreen. RealPlume adds plume expansion to your rockets, and makes them look a lot more like real life. RealPlume is now part of RealismOverhaul proper. RealPlume-stock standalone coming soon! RSS Visual Enhancements is improving the visual appearance of planets and clouds, and it's looking excellent so far! This mod was created by NathanKell and RedAV8R. Currently maintained by NathanKell and Felger. (Contributions by many others). For those wondering about CKAN installs, we're in the final stages of preparing for our 1.0 release. There are pre-release clients available, and the same executable works on Windows, Mac, and Linux (.NET/Mono 4.0 required). RealismOverhaul has always been one of our goals for automated installation. Substitute RSSTextures2048 with RSSTextures4096 or RSSTextures8192 if you love using more memory in RealSolarSystem. If you don't have a fresh install, the CKAN will refuse to overwrite existing mods, so you'll either need to uninstall the existing ones by hand, or wait for our stable release (which will probably still ask you to remove them by hand, but will give you better error messages). Please don't bother NathanKell or Felger with CKAN installation difficulties. If you have trouble, the best way is to join us on IRC, read the docs, or open a support ticket. Awesome! Can't wait for automated installs, my last attempt at manual kinda.... failed. Hello, I would like to add (or modify) the conical heat shields by LostOblivion: http://forum.kerbalspaceprogram.com/threads/91920-0-25-Oblivion-Aerospace-Pack-New-heat-shields-for-DRE!-%28v0-1-3-2014-09-18%29 to work with Realism Overhaul. Being a modding newbie how should I go about this, should I adapt the part and submit it for inclusion? Absolutely, those look pretty awesome! @reflective = 0.08 //No idea, perhaps reflective heat, or some interaction with the flow? @dissipation //sounds like how fast heat dissipates from the heat shield during re-entry at different temperatures. And I'm sure you could find better explanations if you look at the original part file, or at the Deadly Re-entry thread. What I'd recommend doing, though, is basically trying to replicate the configs exactly for the new parts, then tweaking them based on size (use similar sized deadly re-entry heat shields as a guide) and perhaps tweaking from there to make stuff work appropriately. And I'm sure that NathanKell can probably comment on what exactly all the part parameters do for Deadly Re-entry, I'm sure if you sent him a PM he'd be more than willing to answer whatever questions you have. Thank you for your advice, I will take a look and get back to you. I guess the biggest piece of advice I can give you is don't be afraid to screw up. Worst case scenario, you try something and it doesn't work. You cross that off the list, make a new guess, move on to the next thing to try until you get something that works. Yay, glad to see a new thread. If all goes well, I should have time to contribute some configs over the weekend (Porkjet's inflatables will likely be first, since I'm the guy who originally provided RedAV8R with data on their real-life counterparts, so I already have that topic researched). woah, i'm glad that there is a new thread, i couldnt find many instructions out there about what mods are supposed to be used with this. can't wait to use the automatic CKAN installer! In RO, if you hold down "A", then press at the same time "D" and relase "A", the RCS is firing in both directions. The same thing happens when you use kOS to tell it first to pitch 1, and then to pitch -1. 1. stock KSP: does not happen. 4. RO: Bug appears for the first time. The only other mod included is the toolbar. It's be really great if someone could look at it, then I wouldn't have the problem anymore of my probes sending RCS-jet in opposite directions when directed by the flight computer or KOS. Glad to see the mod is still alive and well. I know you'll take good care of it. to many incompatibility to have both. Why not both? 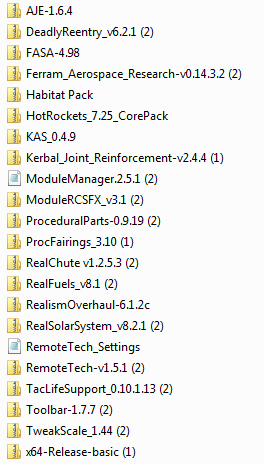 Make a copy of your KSP folder and rename it to something like "KSP RSS" or something. That way you have both stock and RSS versions available simultaniously. Are the old RO builds available anywhere? Specifically, pre-6.12. The latest "officially supported" FASA version seems to be missing some content from the old one (I seem to recall there being more fairing options, for example) and also has some pretty serious bugs regarding its aerodynamic bits (FAR configuration is completely gone, for instance). I've got a brief period of time I could spend fixing some of that, but I don't have pre-6.12 versions anymore in order to roll back the broken entries. All prior RO releases are available from the Releases page on the repo. That's very odd. To my knowledge, other than providing configs for RealFuels and ModuleRCSFX, RO doesn't touch the functionality of RCS. Prior to installing RO, were your RCS thrusters using Monopropellant (the stock resource) or one of the RealFuels propellants? In previous versions, I never seemed to have these launch issues, now it seems every launch I have fails due to them. Is this normal? I think prior to RO it was monopropellant. (I cannot check until this evening.) With RO it was one of the RealFuels. That sounds like a bug in ModuleRCSFX then. Said it before and I'll say it again, too much speed at too low an altitude. Sole purpose was to see what it could take before burning up and it survived its launch without burning off anything. Granted it was stock Kerbin and not RSS but I didn't feel like taking the time to switch over. Anyway, give it a try. OK, here's the list of changes I'm going to make (or already made) to FASA implementation. Feedback welcome. -Fixed aerodynamic surfaces for both S-IB and S-IC. -Fixed H1 gimbal (was disabled by a typo...). -Welded-on fins on S-IC and S-IB removed. -Retrorockets added to the S-IC fin/fairing assembly. -Radial attachment re-enabled on Sergeant motor. -XLR-99 model changed to Orbital Bertha. -Mini LR-91 configured as LR-91-3 (for Titan I). -Add Titan I fuel tanks. -Re-add the (non-generic) S-IB version without the engine attachment plate (useful for re-engining Saturn I). Also, RealEffects mod is now nearing completion. I'm currently overhauling kerolox engines, which are the hardest to do, especially without bogging KSP down. Depending on my RL workload, I might manage to finish it up soon. Does that mean there will finally be proper underexpansion effects in KSP? That would be awesome! Nifty! Thanks for taking that on, Dragon. Feel free to submit it as a pull to RO when you've got it done, I'll review it and include it in the next release.